Why did I buy this particular unit? Well… To be honest, I already had a ZOOM 4-track recorder/mixer/controller that can actually record (via computer/software) 192kHz HD audio that works great. However, the ZOOM recorder/mixer was designed for music recording in mind, and though that is not a valid reason to discount its value, I needed something a bit more portable. Now, when most video/audio folks here the name, “ZOOM,” they automatically envision the H2, H4, H5 or H6 models. None of which are the recorder that I purchased. I purchased the R8 model, which is a mini control surface mixer/recorder. Why the R8? Well that one’s easy to answer… because I’m more of a tactile person and I wanted something that I could have more hands-on control than menu based control. Certainly, the R8 has a lot of menu functions as well, especially when it comes to the EQ section, but it is bulky compared to its counterparts. If your production is shooting in a studio that doesn’t require a lot of movement or is relatively stationary, then the use of the R8 is perfectly fine. But, if you’re shooting on location or need to move a lot (or even a little), then the R8 will become cumbersome in a matter of seconds. Plus the fact that the XLR plugs don’t lock, which can make movement rather precarious. 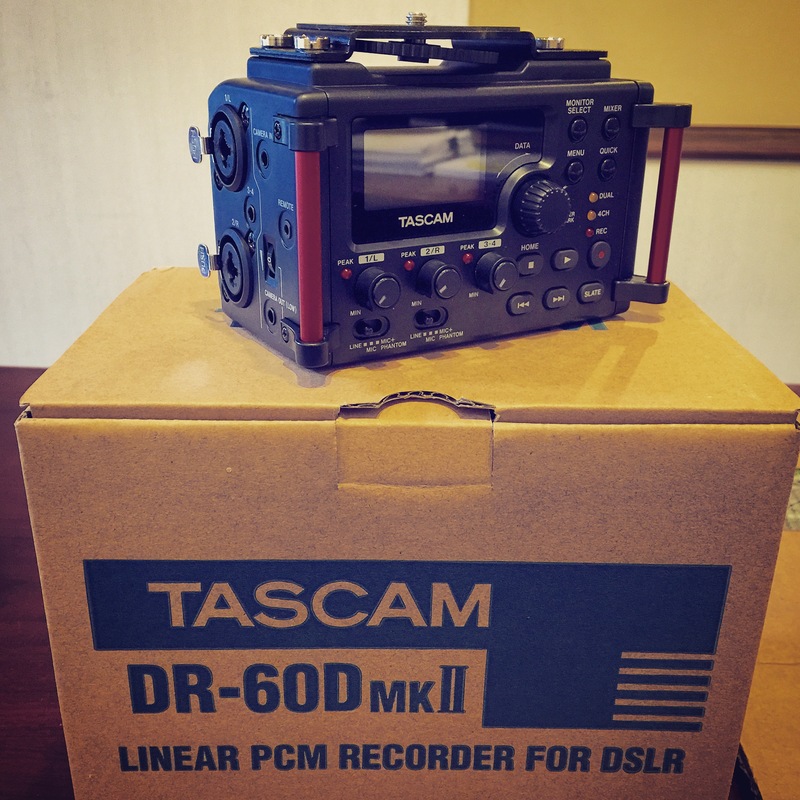 Now, that leads us to the TASCAM DR-60D. The DR-60D mounts directly to the DSLR’s tripod mounting screw. The DR-60D also has a tripod mount built into it, which is common sense, and would be worthless without it. The tripod mounting screw bracket is also removable in the case that it is used as just a 4-track recorder. This allows the mount to be used in various configurations with support rigs and such. It also comes with strap mounts that can be used in a similar fashion, but is not its intended use, which is for use as a stand alone mixer/recorder. Okay, okay… I’m getting to the point. Why did I buy it? Well, the main selling points to me are, its “dual record” mode that allows you to record two tracks with one recording at a set value and another that records and a lower value as a safety. Which means that if you are, “running-and-gunning,” and you don’t have time to properly set the recording levels, you will at least have a lowered safety track to choose from. Now, this doesn’t mean that this is a perfect solution to proper levels, but it is a good option to have. However, the most important function to me, is the audible slate function. Why is this important? Well, anyone who has recorded separate audio without any type of slate knows the perils of aligning audio tracks with their intended video tracks. It may not be hard, but it is a time consuming process. The beauty of this product is that it has the option to leave an audible tone, at either, the head, the tail or both, on the clip. When it’s pulled into Final Cut Pro X or Adobe Premiere Pro it works seamlessly with these NLE’s, “synchronization” and “merge clips” functions. I’ll use Premiere Pro for my example, since I’m not a fan of FCPX (I’m an old school FCP user. I’m sure those in the know, can assume why this is). In Premiere, all you have to do to merge clips by placing a marker at the beginning (or end) of the slate tone. This can be done in either, the Timeline or Project panel. In the Project panel, after marking, simply use any form of the right-click function to access the menu and select, “merge clips,” then select “clip marker” (there is a drop down list next to the radial button, if you have more than one marker attached to that clip). In the Timeline panel, you will have to select “synchronization” first. This will open a similar window as with “merge clips” and everything works exactly the same as with “merge clips” in the Project panel. This will not merge your clips, rather it will align all the selected clips’ markers. You can “merge clips” after this process is completed. Of course, there is another variable option, you can also merge audio clips in the Project panel and drag it to the Timeline then merge it with the intended video clip or you can merge everything in the Project panel and drag it into the Timeline. Okay, so overall, this is a great product for the price. It’s easy to use plus, Tascam always has user-friendly manuals. If you are an indie filmmaker, this is a fantastic buy. It’s build is decent, to say the least. It definitely could be sturdier or heftier, but by cost, you can’t really complain. I love my DR-60D and I’m glad that I bought it.